It is several years since Eilidh’s story first appeared. It is hard to believe how quickly time has passed and how grown up she now is. Eilidh is now 11years old and has just started P7, so this is her last year at primary school, before moving up to secondary. She currently attends a main stream school with a special educational needs unit within. Eilidh loves learning to swim and horse riding with Riding for the Disabled. Although there are still moderate delays she has made improvements in all areas including speech, in fact she chats all day long! It has been almost 5 years since Eilidh has been an inpatient in hospital which has been great. In the past few years new serious health issues have arisen, some of which are associated with PA. Having said that, for me, this past year has been the ‘easiest’ for looking after her, (not that looking after a PA child is ever easy). She is on the least amount of medicines, daily Carintine, Atenolol, Movicol and monthly dozes of Metronidazole. Feeding consists of Paediasure Fibre, Energyvit, Seravit, milk, Yakult and orange juice, but this is currently under review. The limited eating she had has declined, but she does switch back on now and again. Therefore she is now totally tube fed. However she loves the social aspect and still loves ‘doing lunch’ with the girls! She has ventured further a field on holiday and two years ago saw her taking her first flights. As expected she took it all in her stride as if it was a daily occurrence. She just loves the funfair and the wild rides at the theme park. Last year she also was on a visit to London to meet one of her favourite TV characters, courtesy of Make A Wish Foundation. One thing that has not changed about Eilidh is how happy she always is. Eilidh’s sense of humour is absolutely fantastic and she is very much loved by her family, friends and almost anyone she encounters. 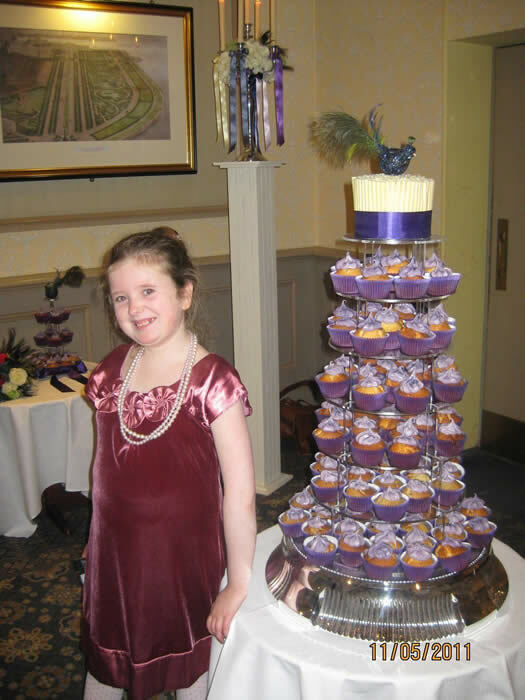 2005 – Hi, my name is Eilidh (Scots Gaelic pronounced Aylay) and I live in Aberdeen, Scotland, UK with my mum RUth and my dad Alan. I was born on the 6th November 2000 and at two days old the hospital discovered I had PA. I was in the neonatal ICU for two weeks before I came home. I am usually in hospital at least a few times a year, but I also visit my consultant and my dietitian every month. I love all the staff at the hospital and they spoil me. I have a g-tube to feed me when I’m sleeping and also for all my medicines and some foods and drinks. When I’m not poorly, I eat all my natural protein allowance for the day, my favourite’s being baked beans & ham, toast, Quavers, bananas and spaghetti. A few days a week I attend Raeden special needs nursery in Aberdeen. I just love it and I get all my therapies going out on the bus on trips with my classmates. I could start school this summer (2005), but I am going to stay on at Raeden another year and go to school when I am five. I am veery happy 99.9% of the time and have a great sense of humour and my Grandma says ‘my eyes are just full of mischief’. I love music, watching tv, going to the park and “doing lunch” with my mum’s friends!